Here is just more proof that the intent of the A’ole GMO club is to keep people in the dark. They somehow also think that by banning GMO imports that everyone is eating organic food. 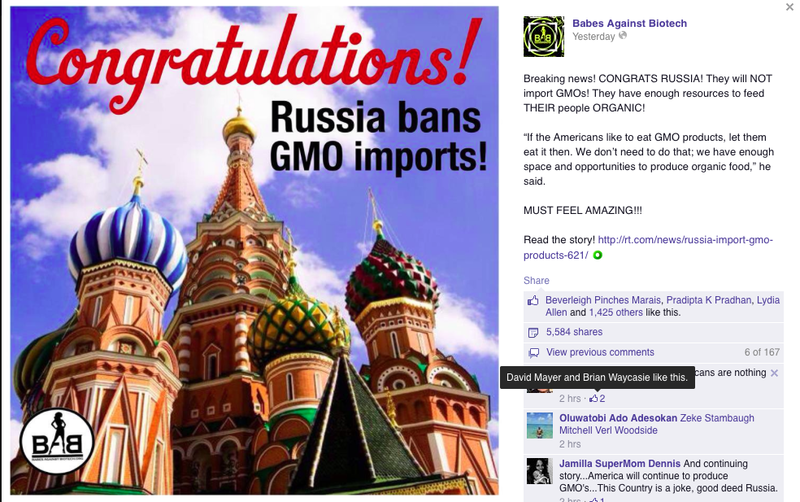 Little do they know that countries that tend to ban GMO imports are the very ones have plenty of their own GMO research going on at the Russian Academy of Agricultural Science. Russia is also growing their own experimental GMO crops. So the BABs have their 5,584 followers, who shared this, excited about Russia being so much better than the US because of this ban of imports. Russia is a much more superior country than the US because their bans signify a better country. That must include their ban of homosexuality and marijuana makes it the best country to live in and tops for human rights. Not. Pack up your bags and head to Russia! This entry was posted in Uncategorized on April 7, 2014 by hawaiifarmersdaughter. 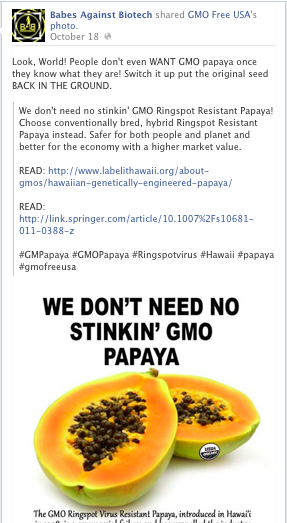 Once again, the anti-GMO club is up in arms with the latest Star Advertiser article that was headline news regarding the lawsuit by papaya farmers. One of which is a State Senator, Russell Ruderman, who wrote a letter to the editor in today’s paper(subscription needed). For all of us involved in the GMO issue, it is clear that an individual farmer is an inappropriate target for GMO anger, and no one advocates vandalism. 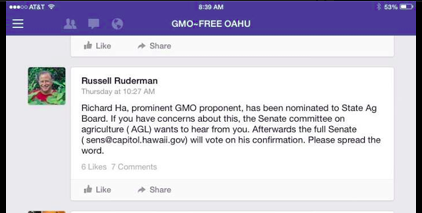 Senator Ruderman must not live here in Hawaii because he clearly does not know about the threats that have been made by the very activists he supports. 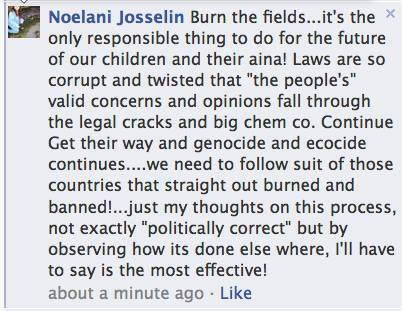 Just look what has been said here in the Hawaii social media scene. If you saw all of this on the social media, as a farmer, what would you think? Ruderman apparently thinks that there is nothing to worry about! We all know that he’s participating in the misinformation campaign himself. Senator Ruderman, why do you keep associating with these people and fear mongering yourself? You and other activists have created so much fear in people that people have turned that fear into hate towards this technology. It’s sad that a leader is fanning the flames of fear also during work time at the legislature. You must clearly know that it is safe because you do consume foods that are GMOs while at fundraisers and also wear it on your back. Could it be profit over people for your Islands Natural Food stores? And, how does he know that it isn’t an anti-GMO activist destroying crops? Is he that close and that he knows this bit of information? 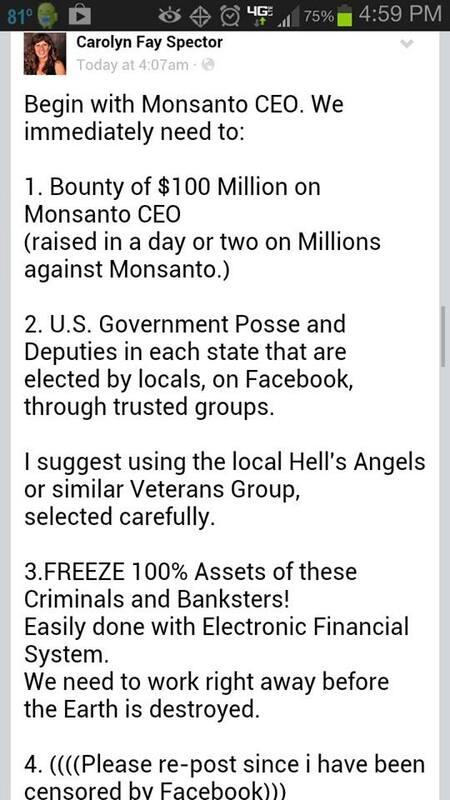 This entry was posted in No Aloha to Farmers, Pono Right to Know Politicians on March 16, 2014 by hawaiifarmersdaughter. The A’ole GMO crowd will always profess that they are special. They are not a part of the sheeple and have done thorough research about GMOs to know that they are experts in the issue. They have sorted through thousands of links from Natural News and GreenMed Info as well as watched countless hours on Seeds of Death and Genetic Roulette. Vandana Shiva is a goddess that they worship and Walter Ritte and Jessica Wooley are the disciples of the whole congregation. Yes, it’s a religion already. It’s ideology about a big evil that they must fight in their own minds. They are being sprayed with pesticides and apparently feel that they must be weeds or bugs. They will no longer stand down and will protest about their right to know even though they do know and consume GMOs. After a meal of GMOs they wake up every morning and can’t believe that they survived it. It happens year after year and by the grace of Vandana, they are alive! These people are so smart that they will bravely go on the social media and let everyone know their expertise on the subject. Just read some of the outtakes from today’s Star Advertiser GMO article. Yes, Leinanij, the false knowledge is worse than ignorance itself. You apparently stated that here. NiteMarcher, who is alive today and well fed and nourished by the advances of wacko and mad scientists, should have not been allowed access to such advanced from evil people. Chemicals that make up NiteMarcher are not natural in any place or form even if we share many of the same ones. He just might want to go back and take that science class again to learn about chemicals. Leino is clearly and expert on pesticides as she knows that 2-4-D is bad even though it is sold in the hardware stores in weed and feed formulations. Forget that it really is 2,4-D that these A’ole fear for it is part of the Agent Orange. They still don’t realize that it wasn’t this issue that made it toxic but the dioxin. That’s because GMO Free USA and the BABs don’t educate people about those “facts” and prefer fear! Papaya farmers have nothing to do with any of the agribusiness companies that Maneki_Neko listed but so what. They are evil. The Babes Against Biotech is going to plan quarterly protests as a result. They are tired of the March Against Monsanto so the next one will be the Suckers Against Syngenta, Dodos Fighting DuPont Pioneer, and A’oles Against Agrigenetics! Bring it on! Fight the evil! Trust is damaged by whom? A’oles trust Gary Hooser and his 18 tons fact and never figured out the significance of something called active ingredients. They also have no clue that table salt is way more toxic that RoundUp but it doesn’t matter. 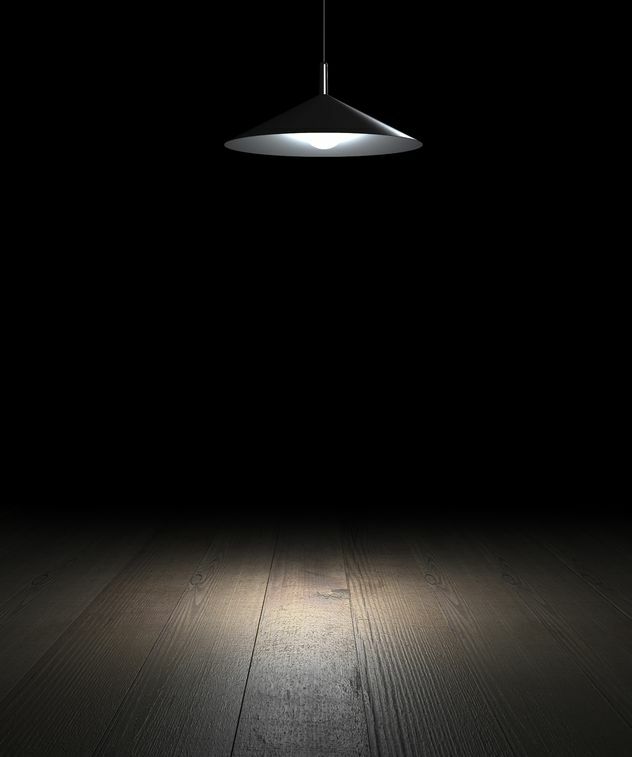 They know their facts from Seeds of Death and a computer scientist, Stephanie Seneff. They also worship tumor filled rats yield tumor filled rats and suffer from single study syndrome. Thank goodness some of them do consider the evidence presented and use some science to base their decisions upon. It’s sad though when choose to believe GreenMedInfo over real data and evidence when it comes to GMOs. This entry was posted in Don't Post that A'ole on March 13, 2014 by hawaiifarmersdaughter. Something has gone awry with the environmental greenies here in Hawaii. These people cling to the the battle cry of, “Protect the Aina!” All the meanwhile of stating this, they constantly barrage the media full of misinformation from the top down. Today’s feature is Margaret Wille and her adventures in stuff your shoe in your mouth! Just from today’s Star Advertiser front page article, “Growing Concerns,” there was the typical A’ole comments on there from Big Island County Council Woman Margaret Wille. Some of her quotes in the article clearly shows that she believes in a boogey man and that organic food may not protect your brain from dementia. They have to know but do know! Kohala Councilwoman Margaret Wille, who introduced Bill 113, said that if the restraining order is upheld, it will frustrate the purpose of the ordinance. She said it’s important to know where the genetically modified crops are so that officials can monitor where potential problems might occur. Note that Wille makes this statement that officials have to know where these papaya crops are but then later states this. “The truth is everyone knows where the GMO papaya is,” she said. Yardeners are Farmers too! NOT! And, for example,if a farmer wants to grow organic papayas, he or she isn’t going to want to plant next to a field of GMO papayas, for fear of cross-pollination and contamination of the organic crop, she said. Yardeners who have 25 trees of GMO free papayas have rights too even though most real farmers know that these will be decimated by the PRSV virus. Real farmers know that papayas are self pollinating and know how to take care of this. Farmers Talked to the County… They were IGNORED! Wille said she is especially disappointed with the legal action because a provision was included in the law allowing county officials to keep sensitive information confidential. She said that instead of waiting to file suit until the 90-day registration period ended, papaya farmers should have talked with county officials to explain what information they wanted withheld. Papaya farmers were there in force talking to the Mayor, the council members, at all the hearings explaining what the issues were with the laws. They told Wille and others what they wanted and lo and behold, they were IGNORED! 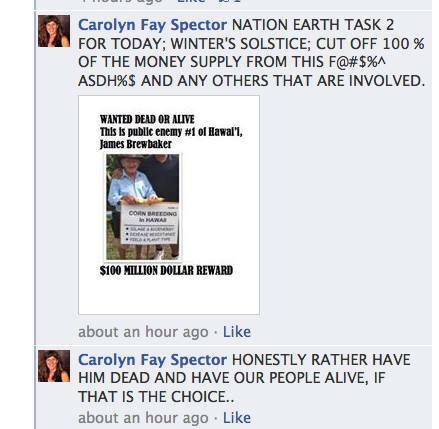 Margaret Wille the Conspiracy Theorist! “The way they did it, they just seem more like pawns of Monsanto,” she said, referring to the multinational corporation known for genetically engineered products. When all else fails for Wille to defend her position, what’s the next best step? Throw in the Monsanto is evil card! But hey, even if papaya farmers are all small local folks for the most part, turn people against them but putting that kind of statement out there. Local farmers, you’re now a multinational corporation according to Marge Wille. That makes for a great anti-GMO movie plot! Ecoterrorist in Pahoa is Ready for Action! Wille said the registry isn’t going to make papaya farmers any more vulnerable. Yes, Marge, continuing to spread hate and misinformation against farmers isn’t going to make them any more vulnerable then they already are. You are a true blue problem solver helping your constituents indeed. Chopping down 100 trees or even 8500 isn’t ecoterrorism! It’s justified according to commenter, NiteMarcher, who also has a demon to fight with corporate ag giants like Big Island papaya farmers! This entry was posted in Uncategorized on March 13, 2014 by hawaiifarmersdaughter. Let’s face it that the mainland activism groups have decided to take root here in our islands. We already know from an investigative report late last year that the majority of the funding is indeed from mainland sources. Many mainland donors are getting tax deductions giving monies to fund supposedly non-profit groups like Hawaii SEED in doing lobbying efforts under the guise of being an “educational” entity. It’s no wonder why other groups, like the Center for Food Safety and Earthjustice, have latched on also. When you look further into the this supposed grassroots movement, it is clearly not based here in Hawaii. It looks like Southern California has come to turn Hawaii into their tropical paradise. It also includes followers that believe in UFOs, ascension, conspiracy, and spirituality. That sounds like a lot of Southern Cali woo indeed. These people not only believe in woo but have decided to bring it to Maui under the guise of a Hawaiian sounding name, SHAKA. When you look up the website (www.shakamovement.org) on WHOIS, you’ll find that it was started on 10/29/2013. Pretty recently formed just a few months ago. This movement was first announced on the Galactic Connection website right about that time in October 2013. Galactic Connection is associated with a Steven Meadors as the registrant and administrator for the website. Registrant Organization: Royal Alliance LLC. As much as this SHAKA movement sounds local, it is far from it and being funded from California. 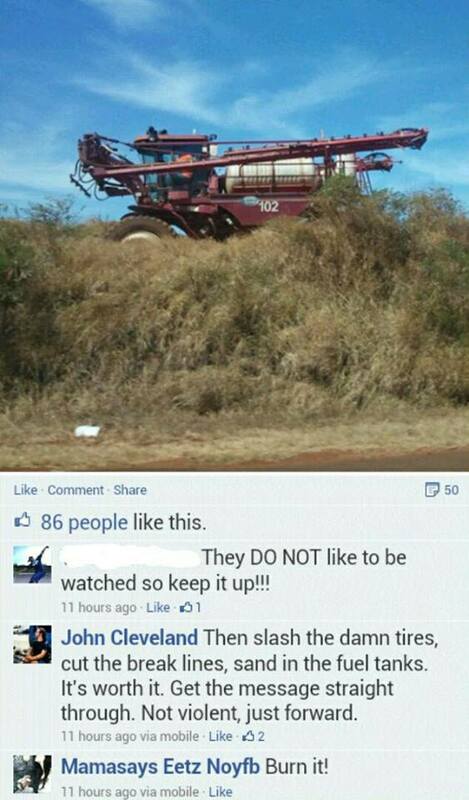 The conspiracy and UFO folks also have convinced the Hawaii Farmers Union United to join in on this ideology too. In their last Maui Farmers Union United newsletter, they placed a link on there to have people join in. The Maui A’oles are trying to also trying to get this on the ballot with this mainland petition. 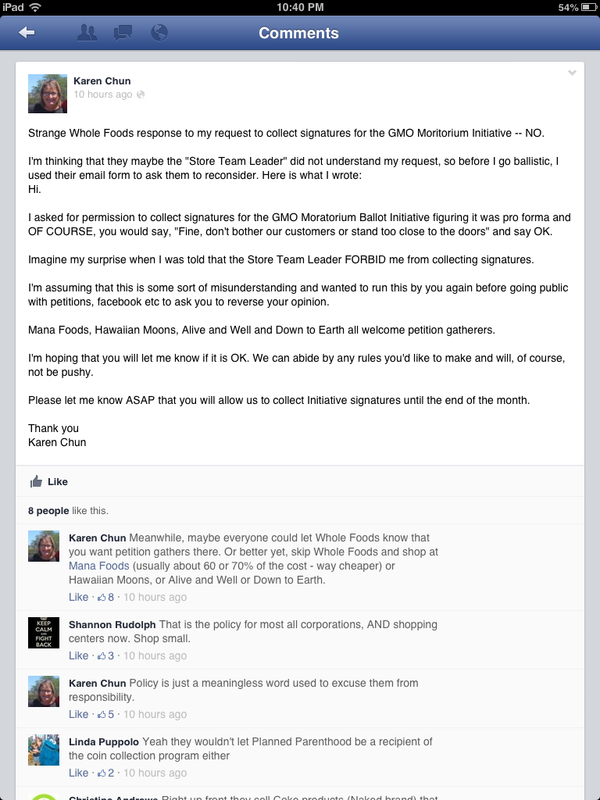 One of them, Karen Chun, tried to use Whole Foods to get folks to sign and it looks like, gasp, they refused to allow the petition to be there! So as much as you might think that this SHAKA thing is a locally initiated thing, you’re wrong. It indeed is California style coming to Hawaii with UFOs, ascension, conspiracies, and spirituality. The woo factor is floating around indeed. 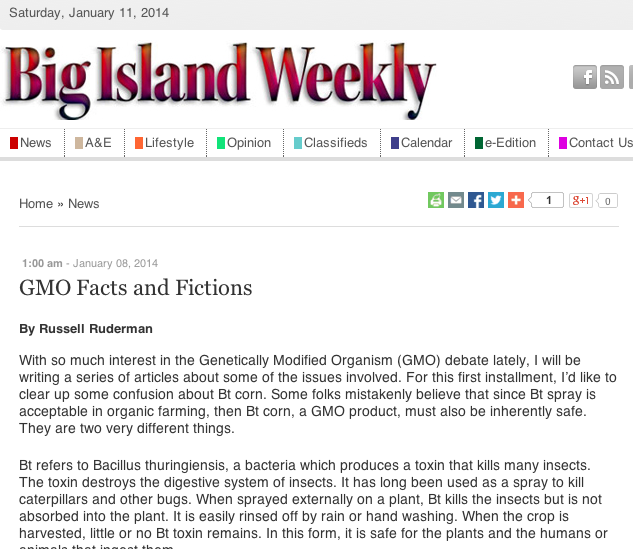 This entry was posted in Research 101 on March 10, 2014 by hawaiifarmersdaughter. The A’oles Admit It: There is No Aloha! Funny how some A’oles have denied that it is only a small minority of activists who have no aloha. They will claim that the ones who have made threats of crop destruction and death threats just don’t reflect the overall goal, the right to know. Well today Keliihananui Crabbe has finally come clean with their true goals today. He admits that yes, there is no aloha. And it’s a good thing he has no financial ties because anyone and everyone who does can’t be trusted. I wonder what that says about Senator Ruderman and Representative Wooley. This entry was posted in Don't Post that A'ole, Uncategorized on March 9, 2014 by hawaiifarmersdaughter.